My friend, Tim Carman, who writes the Young and Hungry food column for D.C.'s City Paper, recently blogged about how he prefers not to take his sweet and wonderful wife, Carrie, to restaurants on Valentine’s Day. I’m with Tim. The few times Paul and I have gone out to restaurants on Valentine’s Day, we’ve been disappointed at how rushed we feel; at the dent in our wallets; and at the gigantic quantity of food we eat. Our most romantic dinners have taken place during spontaneous trips to wine bars after work where we linger for far too long and whisper, stool-to-stool, in each other’s ears; or during the ‘date nights’ we create for ourselves at home. For special occasions at home, I enjoy classic steak dishes such as steak au poivre made with filet mignon or New York strip steak with Bordelaise served with a simple vegetable side. 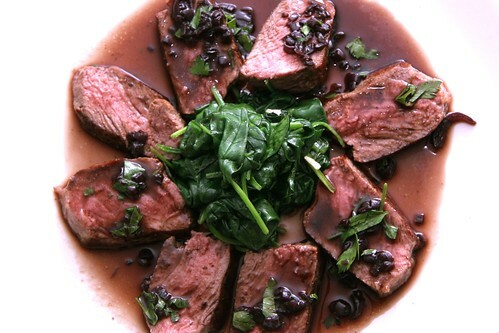 I recently discovered Bordelaise after making veal demi-glace, the sauce’s key ingredient. You can make demi-glace yourself or buy it from specialty food stores such as Gourmet-Food.com. Bordelaise, the wine-enriched, thyme-infused sauce made with demi-glace, is meaty and full of flavor but surprisingly light. It's made silky by adding a pat of butter at the end before drizzling it over the steak. In a 2-quart saucepan, combine the wine, thyme, shallots and bay leaf. Reduce the wine over medium-high heat until almost evaporated. Discard the thyme and bay leaf. Add the veal demi-glace. Cover, remove from heat, and set aside. Heat oven to 500 degrees. Heat oil in a 10-inch non-stick skillet over high heat. Sear the stakes, flipping once, 4-5 minutes. Transfer skillet to the oven and roast until steaks are medium rare, 4-5 minutes. Place steaks on a plate; and let rest. Return the saucepan to medium heat and whisk in the butter. Remove the saucepan from the heat and stir in the parsley and season with salt and pepper. Transfer steaks to a cutting board and slice into ½-inch slices. Add the accumulated juices to the saucepan and stir. Divide the steak slices between the plates, drizzle them with sauce, and sprinkle with fresh rosemary and thyme over the top. 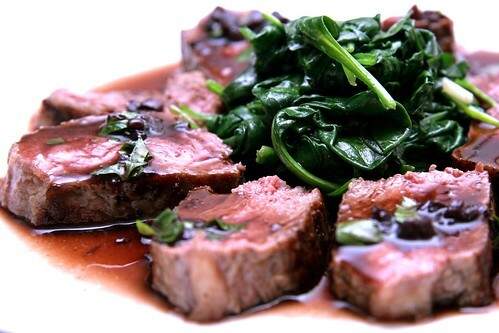 Serve with spinach sautéed in olive oil and minced garlic or baby greens. Oh Angela, my mouth water to look at the photographs. The meat look so juice and love the sauce too, of course it's delicious! I knew the minute you post it veal demi glaze, you'll come up with such an excellent recipe. Thanks, Elra. I'm glad you like the photos! Joan -- Totally agree. Food is a beautiful expression of love and it doesn't get much better in my mind than NY strip with bordelaise! Maryann -- Nice to know there are others who enjoy staying at home for V-day. Thanks for the compliment on the photos! Now that is romance, Angela. I totally agree about restaurants. I would so much rather cook and have time/energy to spend on each other! Angela, it's 9:30 in the morning and I'm craving steak. I can't think of 1 post from you that isn't tantalizing. That looks really good! Nice presentation. The meat looks like it's been cooked to PERFECTION. I find it so amazing that yours actually looks better than the original version... whenever I follow a recipe, mine never turns out looking as good! Andrea: I'm glad you agree! I think there are a lot of us out there that prefer to hunker down for V-day. Yay, us! Thanks, Peter! Steak for breakfast? Why not? Come on over! Thanks, Jesse! I think I've developed a sixth sense for when to take a steak out of the pan. When it comes down to it, the only thing you have to do really well with steak is cook it perfectly medium-rare. The rest is a pinch, don't you think? Thanks for stopping by. Ms. C! Yeah, all that sweetness of yours is just SO nasty. Come on over Ms. bee-yotch and I'll cook you a steak! I absolutely love making demi glace, but rarely do it because of the time. Generally, I use it in soups and braising sauces, but I will definately use this recipe next time I make it. Also, coming from a waitress, we appreciate it when people stay in! Let's face it, it makes it easier for everyone! Madeline: I hear you about the time required in making demi-glace. It's a real commitment but so worth it. Great idea to add it to soups! I will try that. This bordelaise looks amazing... one small addition which I have tried and found has added a tremendous brilliance in taste is to start by cold soaking beef bones a day before making the bordelaise..
After cold soaking the bones, I take my thumb and push the marrow out which should come out easily enough. I cut the marrow into small 1/8" - 1/4" thick discs and add the soft marrow to the hot bordelaise several minutes prior to completion. the rich beef flavor complements the demi-glace and wine reduction like none-other and adds a tremendous flavor when atop a 2 inch thick filet mignon. ;) Try and enjoy! I love this idea. Thanks, Gary!